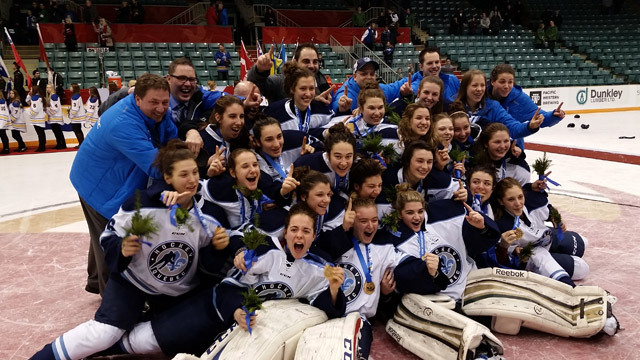 Replacing the National Women's Under-18 Championship every four years, the Canada Winter Games highlights the future of the women's game in a province vs. province showdown for a gold medal. Women’s hockey was added to the schedule beginning with the 1991 Games in Charlottetown, P.E.I., when Hayley Wickenheiser scored the gold-medal-winning goal for Alberta as a 12-year-old, giving a glimpse of what was to come during a record-setting career with Canada’s National Women’s Team. Ontario (4G 1S 1B), Quebec (1G 3S 3B) and Alberta (2G 0S 2B) have dominated the medal count, winning 17 of the 21 medals awarded. The women’s hockey tournament has produced an impressive roster of alumnae – of the 21 players who won gold at the 2014 Olympic Winter Games, 15 made an appearance at the Canada Winter Games. 2019 Alberta Quebec British Columbia Red Deer, Alta. 2015 Quebec Ontario Alberta Prince George, B.C. 2011 Alberta Quebec Ontario Halifax, N.S. 2007 Ontario Manitoba Quebec Whitehorse, Y.T. 2003 Ontario Quebec Saskatchewan Bathurst, N.B. 1999 Ontario Quebec Alberta Corner Brook, N.L. 1995 Ontario Saskatchewan Quebec Grande Prairie, Alta. 1991 Alberta British Columbia Quebec Charlottetown, P.E.I.